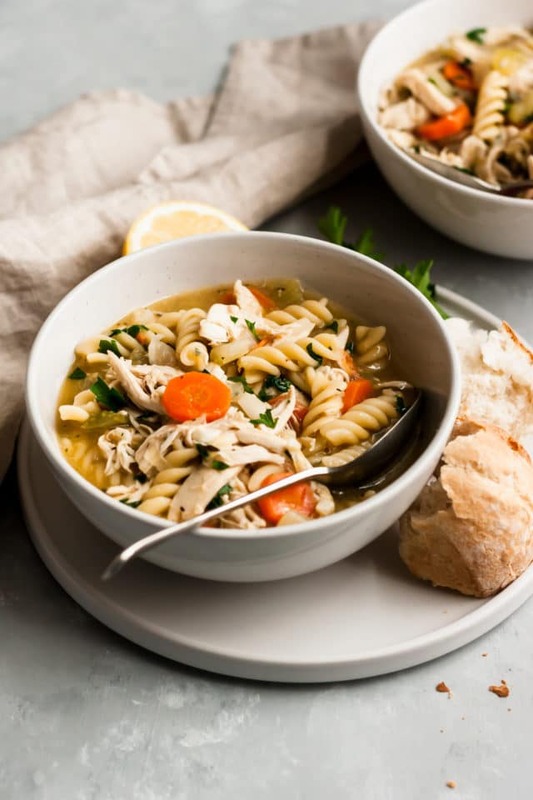 Loaded with good-for-you ingredients and full of flavor and comfort – I absolutely cannot wait to share this copycat Panera Bread chicken noodle soup with all of you! This post was originally published on 12/31/2015. 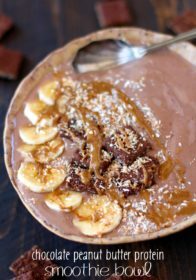 It was republished on 3/13/19 with helpful recipe tips and new photos. What noodles to use for chicken noodle soup? 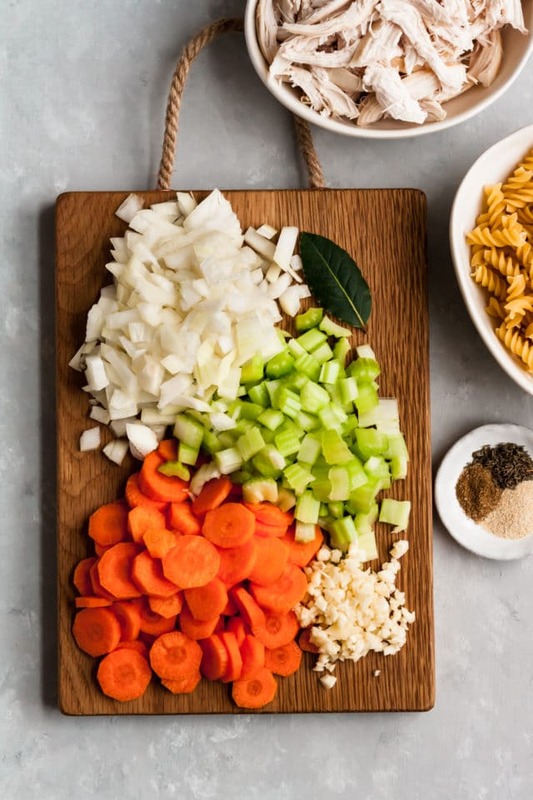 I really appreciate a good chicken noodle soup recipe with classic ingredients. Panera Bread makes a super tasty all-natural chicken noodle soup and after enjoying a cup, recently, I decided to come home and recreate the deliciousness. I kept my version gluten-free by using quinoa rotini pasta from Trader Joe’s and honestly no one in my family could tell a difference. 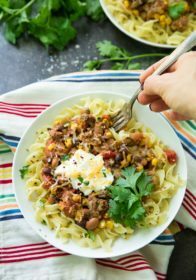 I really favor the texture of the rotini noodles as opposed to using long noodles or even egg noodles, but any favorite pasta noodle will work just fine in this recipe. I think you’ll agree with me, when I tell you that my Panera Bread chicken noodle soup turned out even tastier than the original. I like my soups to be nice and chunky, with a bold, flavorful broth. I only used 4 cups of chicken broth and really packed in the chicken and veggies. Feel free to use another cup or two of chicken broth or even water, if you prefer more liquid to your soup. 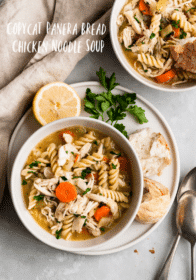 Chicken noodle soup is one of the easiest soups to whip up in a flash (especially when you use shredded rotisserie chicken), the ingredients are inexpensive and it feeds a crowd. When I’m really in a hurry, sometimes I even buy pre-chopped vegetables along with the rotisserie chicken. 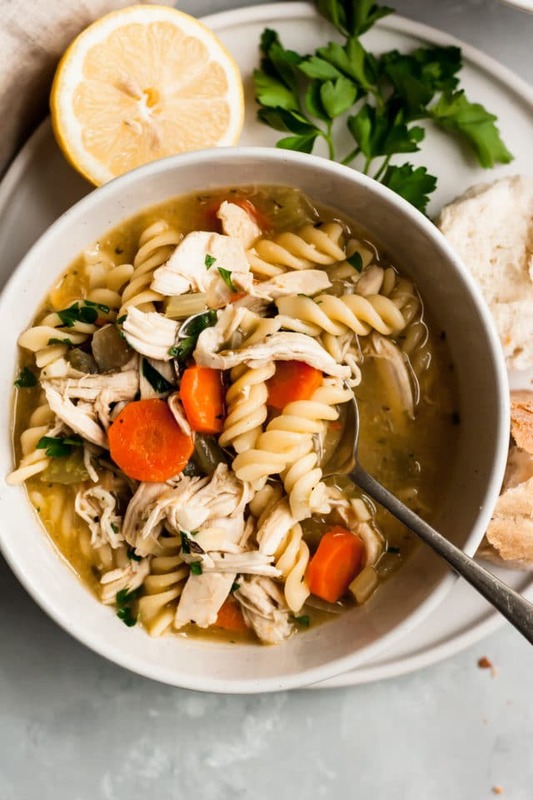 It’s the fastest way to make this chicken noodle soup recipe, and it always turns out SO good. 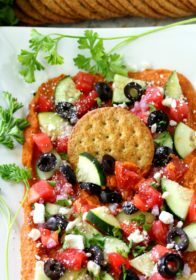 When I make this in the slow cooker, I use 1 pound of raw chicken breast or I add the rotisserie chicken in at the very end of cooking. Add all ingredients except for the pasta to the slow cooker. Cook on high for 4 hours, or on low for 8 hours. Remove the chicken and shred, then return to the slow cooker with the cooked pasta and serve with fresh parsley for garnish. 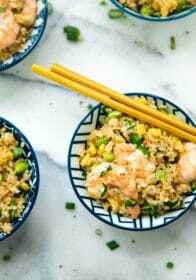 When I make this in the instant pot, I use 1 pound of raw chicken breast. Turn on the sauté function and add olive oil with onions, celery, carrot, garlic, salt and pepper. Cook until the onions are translucent, stirring occasionally, about 4-5 minutes. Add the chicken, broth, bay leaves and other seasonings. Cook on manual setting on high for a total time of 10 minutes, then release naturally. Once the pressure is released, remove the lid and take out the chicken breast, remove and discard the bay leaf. Shred, then return to the pot with cooked noodles, stirring to combine, and serve with fresh parsley for garnish. In the refrigerator, homemade chicken noodle soup will last about 5 days in a covered container. Chicken noodle soup is perfect for making ahead or making a double batch and freezing. Just make the recipe as written except for adding in the noodles. Cool the soup down completely, seal tightly in a container, and freeze. When you’re ready to defrost, refrigerate the day before. Reheat on the stove in a saucepan and add cooked noodles at that time. Homemade chicken noodle soup will last in the freezer for about 4 months. 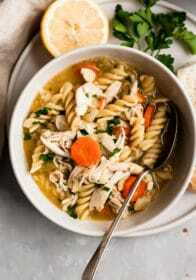 Watch the video, below, to see how easy this delicious chicken noodle soup is to cook up! 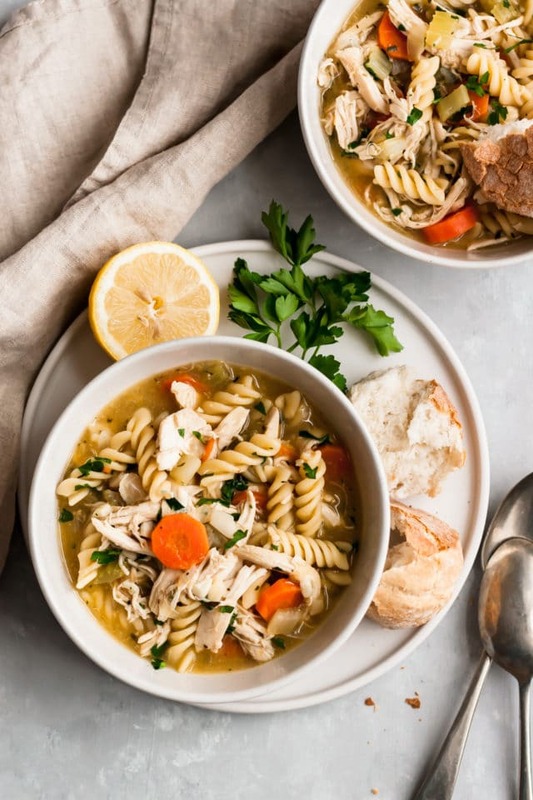 Loaded with good-for-you ingredients and full of flavor and comfort- you guys are going to love this copycat Panera Bread chicken noodle soup! Add onion, celery and carrot to the large pot; cook, stirring frequently, for about 9 minutes or until carrot is tender. Add garlic and cook one minute more. Add broth and seasonings, stir to combine and bring to a boil. Add pasta and chicken, reduce heat to low; gently boil for 10 minutes. Add lemon juice and fresh parsley before serving. Taste and add additional salt, if needed. *If you like more liquid in your soup, add an additional cup or two of chicken broth or water. **Ingredients are a guide, use as little or as much as you prefer of each ingredient. Your version of this chicken noodle soup is delicious and is now my go-to recipe! 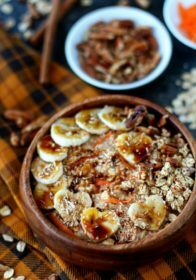 My kids loooove it — we eat about once a week during the fall/winter. So quick and easy using a rotisserie chicken. The lemon gives it something special! Your comment makes my day!! I’m so glad your family loves the chicken soup as much as mine does!! This really was a great recipe. Thank you for sharing it. Very easy to follow. I used to bones from the rotisserie chicken and the ends of the veggies with some seasoning to make chicken stock simply because I ran out of the store bought stuff. haha! Your seasonings are spot on! Well done! I’m so glad you enjoyed!! Thanks so much for taking time to comment! 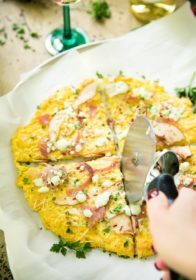 I love how quick and easy this recipe is! And so many great flavours there too. This is so much more buget friendly than going there as much as I would love to. This soup is one of my favorites. This chicken noodle soup looks absolutely amazing! I can’t wait to try it. Nothing beats a good nourishing bowl of chicken soup. Especially now as we are having incredibly windy and cold days. Love the look of this. This looks just like the chicken soup my mom made me when I was little, I’m craving it now!